"Any guitarist in Charlotte, of any skill level, will benefit from lessons with Tosco. and the experience he has had with you this year. "Matthew, if you don't get your homework done, no guitar"
"Mom, I'd rather jump off a building than give up guitar." pieces for Berklee College of Music. He was accepted and is now in his first semester. "He had Junior playing songs after his first lesson. ​The man is amazing. Give him a call." "​Sometimes I feel such profound appreciation, I just have to say something. That lesson last night was one of those points in time that changes everything…. What I want to say here is a recognition of your very fine and rare gift as a teacher. The ability to get right to the heart of what needs to be learned, and how. that experience into my work in the classroom. You are inspiring. If you'd like to add your feedback, please visit the Tosco Music Studio Facebook Page. ​Many of John's students continue lessons for several years at a time. Some choose to develop their skills and can be seen performing around Charlotte. Here are just a few of John's students who continue to grow and share their gifts of music! Natalie is currently a professional singer-songwriter in Nashville, TN. Maddie attended Berklee College of Music and now lives in Asheville, NC. Desmond is now a professional singer-songwriter living in Paris. ​and a member of The Detours in Boston, MA. 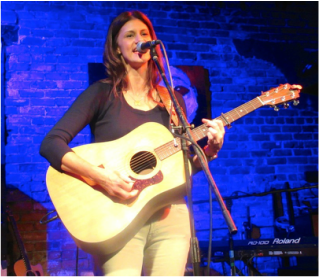 Melissa is a singer-songwriter in Charlotte, NC as well as a minister at Unitarian Universalist Church of Charlotte.